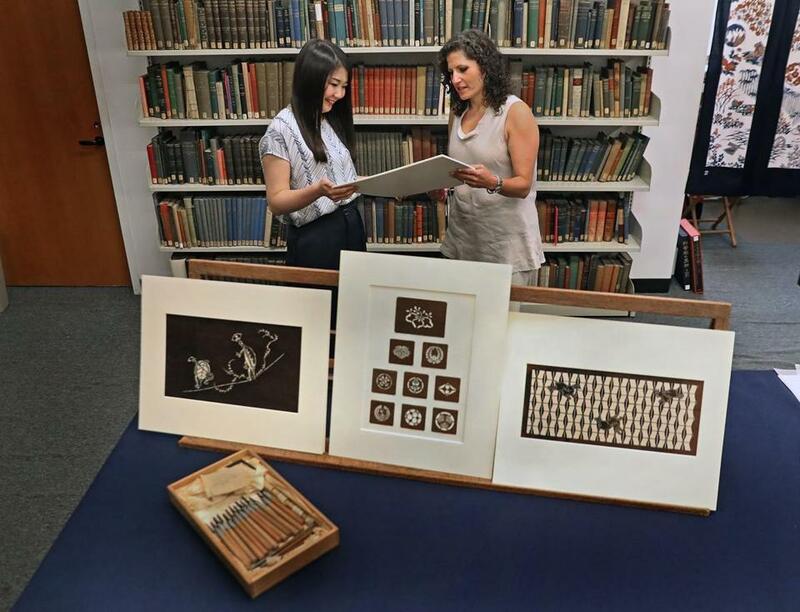 Yuiko Hotta, research associate for Japanese art at the MFA, and Katie Getchell, the museum’s chief brand officer and deputy director, with some of the katagami stencils. A quick glance at Uniqlo’s latest collection of graphic T-shirts doesn’t reveal much — the printed tees feature straightforward geometric designs and motifs of flora and fauna. But take a closer look at the shirt — or rather, the tag attached to it — and you’ll find that the detailed patterns come from the Museum of Fine Arts’ collection of centuries-old Japanese katagami stencils — thin, intricate paper stencils traditionally used to dye textiles and garments. To be launched on Aug. 20, the line features eight women’s designs and seven for men. It marks the first retail collaboration between Uniqlo and the MFA. The Japanese clothing retailer and the museum are in the second year of a 10-year partnership established in 2017; Uniqlo also supports the museum through art-making events, the Boston Festival of Films from Japan, and the translation of the MFA Family Guide into Japanese. Uniqlo designers saw more than 400 of the museum’s collection of roughly 4,200 katagami stencils, many of which came from art collector William Sturgis Bigelow in the late 1880s. 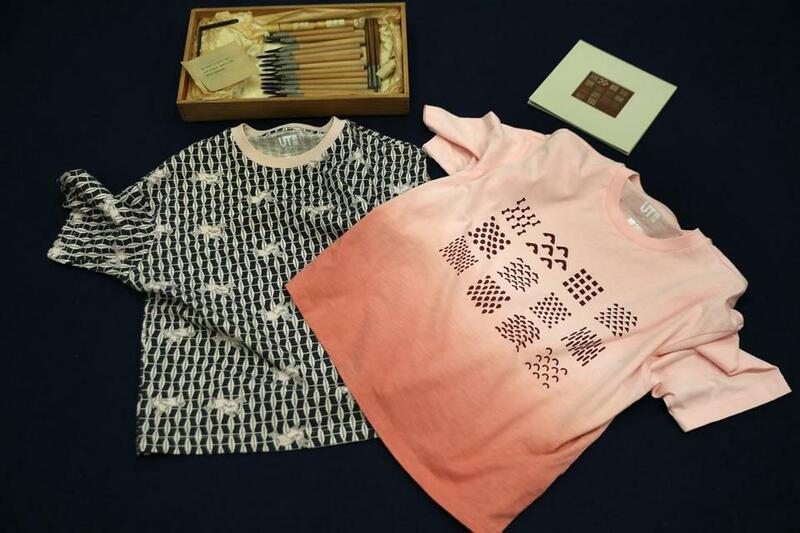 According to Katie Getchell, the museum’s chief brand officer and deputy director, it didn’t take long for Uniqlo designers to settle on the katagami stencils as the inspiration for the first line of shirts made in collaboration with the museum. “They fell in love right away,” Getchell said. Getchell hopes that the shirts, which will be available online, in Uniqlo stores, and in the museum’s gift shop, will increase accessibility to art that isn’t usually on view in the museum and might be difficult to display on a gallery wall. While the museum is in the process of digitizing the collection, the stencils have largely remained in storage. “To be able to take a collection that’s largely a study collection in storage and have it be accessible to the world on a T-shirt, it’s just a great way to improve access to our collection,” Getchell said. Some of the katagami stencils will also be on view at Uniqlo’s Newbury Street location during the Aug. 24 launch party for the shirts. The stencils, traditionally used to dye textiles, weren’t always considered to be works of art, according to Yuiko Hotta, a research associate for Japanese art at the museum. “In Japan, the people thought it was just a tool,” Hotta said. It wasn’t until an MFA exhibition in 1910 that the stencils came to be seen art. Now, as the inspiration for the T-shirt collaboration with Uniqlo, the stencils serve both artistic and functional purposes. Some tees, featuring patterns of animals and florals, showcase traditionally elaborate katagami stencils. The motifs were carved using sharp, thin knives and tiny, shaped cutting tools akin to a hole punch; the museum also has a selection of the punches and knives in their collection. As visually compelling as the patterns may be, Hotta emphasized the cultural significance of the katagami stencils. Hotta pointed out a stencil of a rabbit — which, with a diamond pattern, appears on one of the women’s style tees — and noted that the animal symbolizes longevity in some Asian cultures, including Japan and China. Kaya Williams can be reached at kaya.williams@globe.com. Follow her on Twitter @Kaya_Noelle.